In order to increase their market share, beverage bottling companies have to test innovative packaging solutions allowing substantial cost and energy savings and ensuring high levels of production efficiency. 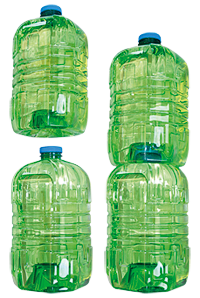 For that reason, SMI has developped a new type of stackable container in PET called "neck-in- bottle", which, in comparison with a standard bottle, features a much deeper bottom hollow; that configuration allows to stack several layers of bottles without any space gap in-between, since, thanks to the innovative bottle bottom design, the neck of the bottles on a given pallet layer fully inserts into the bottom hollow of the bottles standing on the overlying layer. 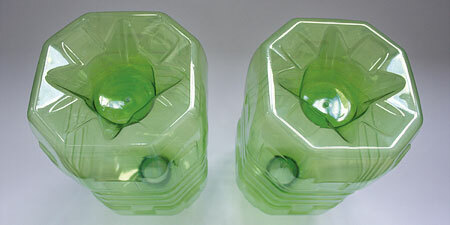 For instance, 5-liter "neck- in-bottle" stackable containers allow to get 4-layer pallets; that means one layer more in comparison with the 3 layers composing a pallet of traditionally-shaped containers, with a 25% increase in the number of bottles palletised with no meaningful changes in the final size of the pallet. enhanced visual appeal of the pallet: the pallet is more compact and offers greater possibilities for product promotion by using eye-catching graphics.